The Rochester School District's Parent Advisory Council is concerned about the amount of recess or play time for students. Chair Ericka Simmons says it often seems time and support for play is a casualty of budget pressure. "A lot of people are under pressure with the Common Core and they might see, okay, well, this might be the easiest thing to cut - let's cut out their time to actually be involved in something so we can have more classroom time, more instruction time." Simmons said they were disappointed in the responses from candidates for School Board on this issue. Dina Faticone of the Finger Lakes Health Systems Agency Healthy Kids project helped the district develop its current recess goals. "We really see recess as an important part of the day in conjunction with physical education, so that kids are getting the recommended amount of physical activity per day that can help improve academic performance." 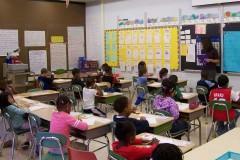 Faticone says for elementary students, the RCSD pledged to provide 20 minutes per day.